Thank you very much for your interest in hosting a Pray for Japan screening! This is a place where you can find all the necessary items for hosting your own screening of Pray For Japan. 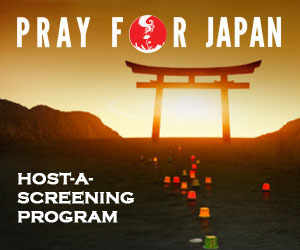 If you want to see Pray For Japan in a local theatre, and you live in the United States of America, check out our Tugg page, where you can crowdsource a screening at one of many wonderful venues. Hopefully you’re ready to join a passionate and talented group of volunteers from around the world who have teamed up to spread our important (and positive) message of COMPASSION, SELFNESSNESS and HOPE. These are the Japanese values that Stu experienced on the ground in Tohoku right after the tsunami tragedy – and we are all believers in their life-affirming qualities. Our Host-a-Screening Program is designed to encourage as many people as possible to share the film and its message with others. While there is a small administrative fee to cover costs, the entire program is set up to either screen the film for free or to raise money for charitable organizations active in the Tohoku recovery. The licensing & administrative fee’s price is based on a simple calculation of the cost of exhibition media (Blu-Ray or DVD, other media available on request) and the shipping and handling costs. We encourage Blu-Ray because it is very affordable exhibition media while retaining high-quality HD visuals. Our goal is to keep this program very simple so that your time can be spent on what’s important: getting the word out to your community and hosting a wonderful experience for all. Thank you for your inquiry and welcome to the Host-A-Screening program! If you want to host a screening yourself, we have many materials you can use and download right here.